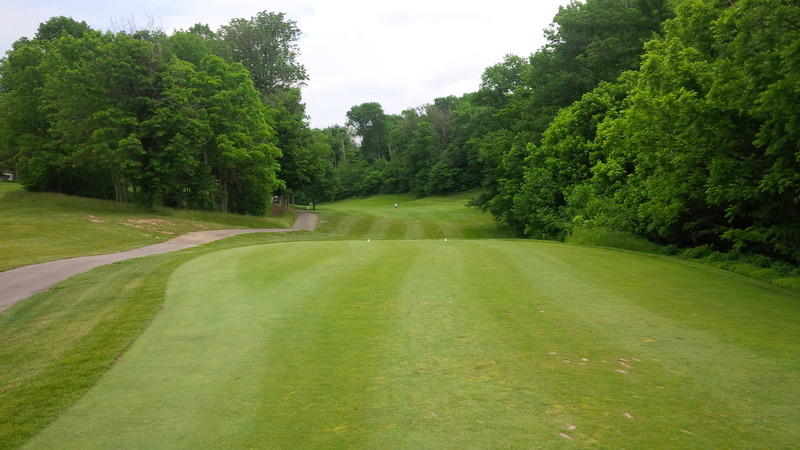 The view of the relatively gentle par 5 1st hole from the end of the first fairway. One of many holes that a smarter golfer won’t hit driver on the tee at Lassing Pointe. 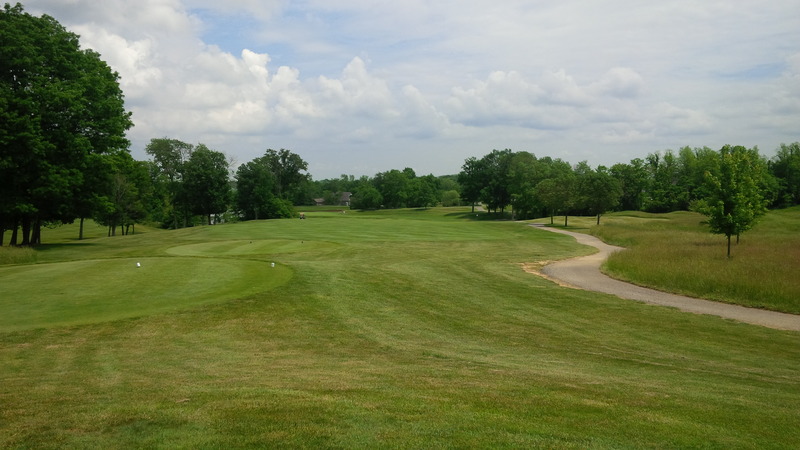 Lassing Pointe golf course in Union, Kentucky, is one of the true gems that I’ve enjoyed playing in the greater Cincinnati area of Northern Kentucky. 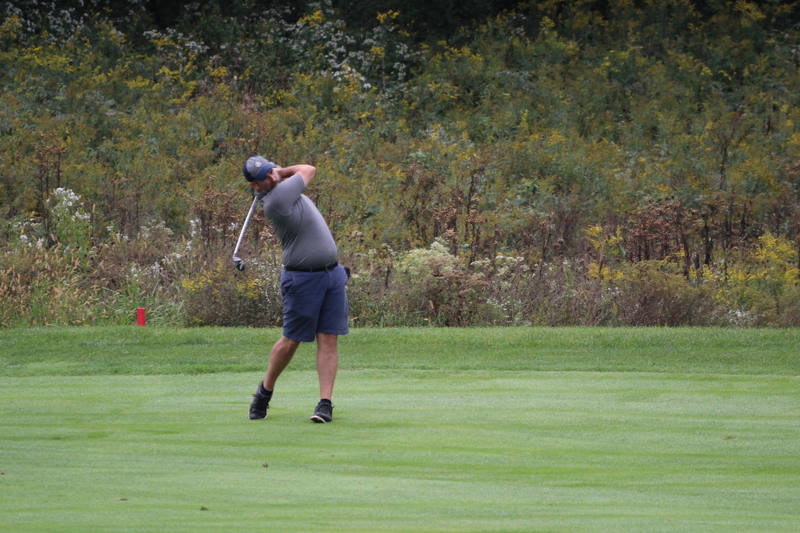 The rolling terrain and collection of streams, woods, and ponds provide a great variety of holes that require accuracy, creativity, and discipline. I’d played the course once before, probably 3 or 4 years ago, prior to last week’s trip, so it wasn’t completely new territory. Lassing Pointe possesses the hallmark, for me, of a really high-quality golf course: I could remember hole layouts, feelings from being on the course, and shots I hit the first time I played it years after actually playing there. 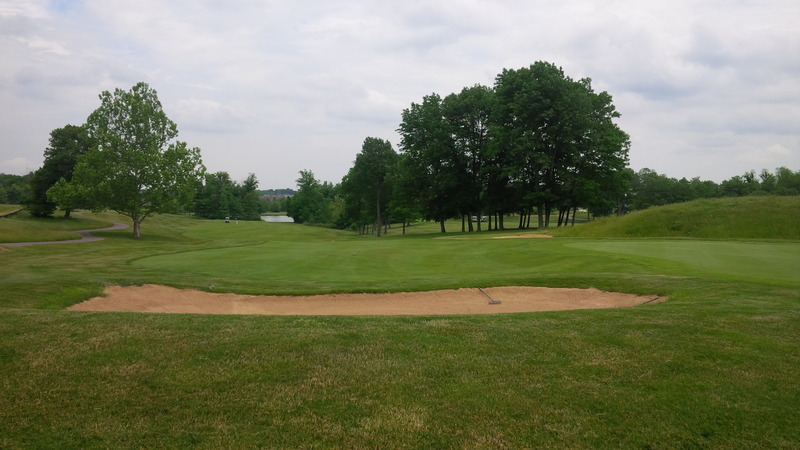 What constitutes the “signature” hole of Lassing Pointe may differ amongst golfers, but that is because there are so many quality golf holes on the course. Typical of Lassing Pointe’s quality, the par 3 5th hole is extremely short, but severely penalizes the errant shot that misses the green. There are great and memorable holes that happen to be par 3s (No. 14), par 4’s (Nos. 3, 9, 13, 18), and par 5s (Nos. 8, 10, even 15). While every single hole isn’t great, even the tamer holes at Lassing Pointe come across as above average due to their pristine conditioning. The course flows comfortably and logically away from, then back towards the clubhouse on both nines. Though the full of mature hardwoods, there are some nice, scenic vistas from several of the elevated tee boxes. The course isn’t exceptionally long from the Black tees, playing to a course rating and slope of 69.0/129 at 6,256 yards. However, it is a thinking man’s golf course without really being a course that forces one to play target golf. This view of the chute awaiting the tee shot on the 8th tee looks intimidating, but an accurate tee shot gives way to a great scoring opportunity. Lassing Pointe subtly presents one risk-reward decision after another. If one is really controlling the driver, with respect to distance, trajectory, and shot shape, the course is ripe for attack, rewarding aggressive play with easy scoring opportunities. However, there are many holes where exceptional length without perfect shaping will inhibit scoring. 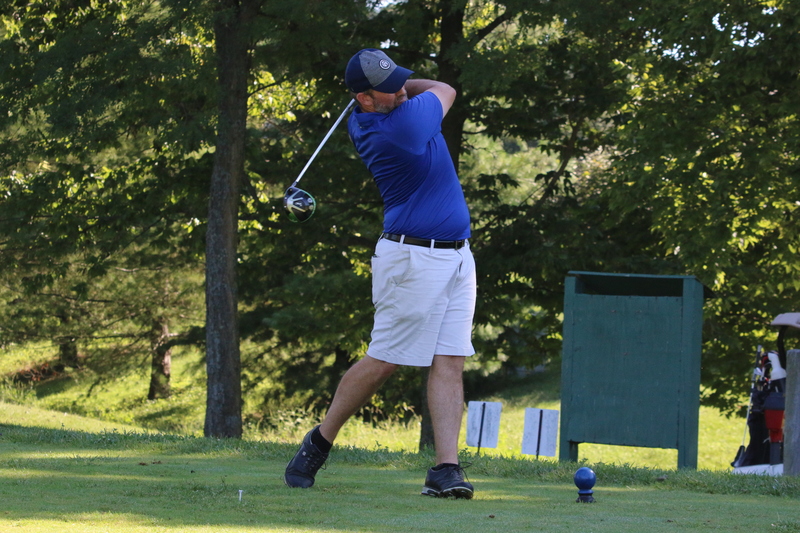 The landing areas off the tee are pretty generous, with a couple of obvious exceptions, and several holes narrow severely as one approaches the green. Last week, I was hitting one of two shots with my driver: either striping it exactly where I aimed, or snap hooking a low, hard turning runner short and left. The short par 4 12th hole is one of many that pulling the driver on the tee was never a consideration. So, I only remember pulling my driver two or three times on the front nine, though I opened my game up a bit on the back. 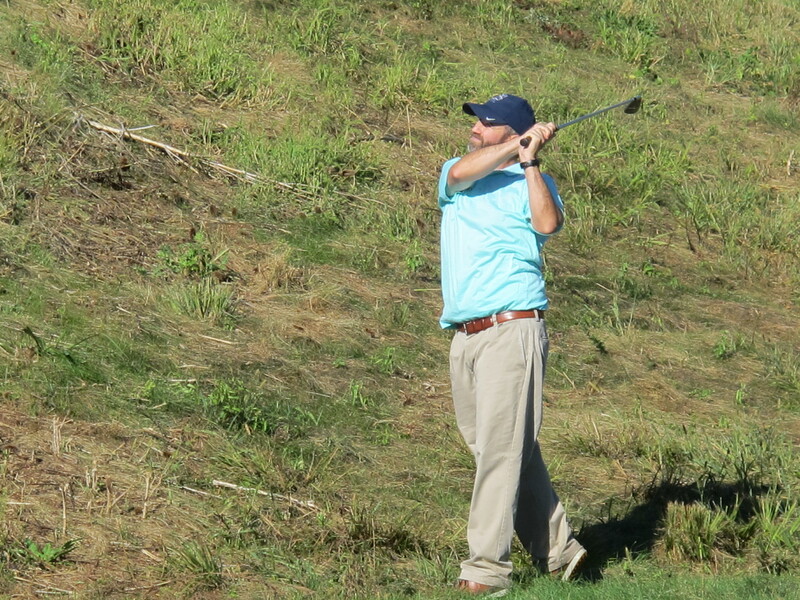 The bent grass greens at Lassing Pointe were lush and receptive, so there were plenty of scoring opportunities, even from the longer approaches that a 3-wood or hybrid off the tee left in. 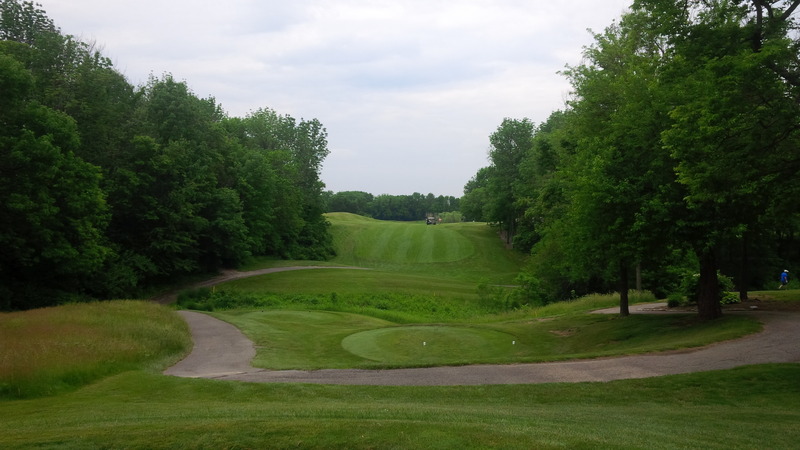 As lovely as the actual course and facilities at Lassing Pointe are, perhaps the most remarkable fact about the course is that it is a municipal course, owned and operated by the government of Boone County. Conceived and created by Dr. Michael Hurdzan in 1994, Lassing Pointe exemplifies how public, municipal golf can be of the highest quality and provide tremendous value to golfers of all skill and income levels. A look back down the fairway from the elevated 15th green. I loathe to describe any course as a country club experience for the average hacker, but that pretty accurately describes Lassing Pointe. In its brief history, Lassing Pointe has hosted the NCAA Regional Championships in 2002 & 2004 and the 1996 & 2000 Kentucky Open tournaments. 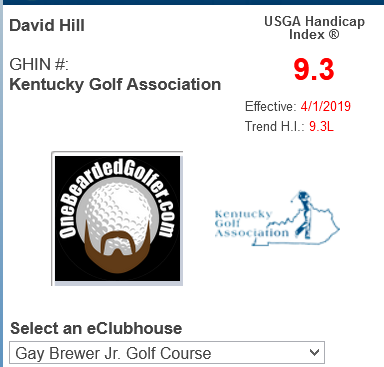 Rated 4.5 stars by Golf Digest, after nearly a decade of maturity, the course was named the top public golf course in Kentucky by Golf Week in 2003. Nothing I observed in my recent trip back to Lassing Pointe indicated that the course should be thought any less of this year. 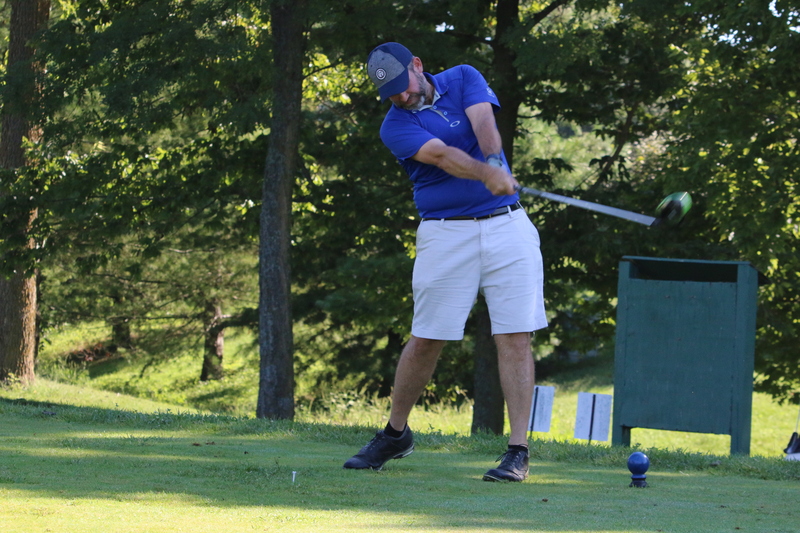 With the wind at my back and the fairway sloping away from me, I finally straightened out a drive and ran a 300+ yard drive around the pond to a narrow landing area, allowing me to close the day with a feel-good par. It is a fun, full test of golf. To score well, you need to be able to shape shots in either direction and think about your tee shot before you strike it. The greens are larger than average, but even with lots of shelves and undulations, they hold enough moisture to remain receptive to decently struck golf shots. 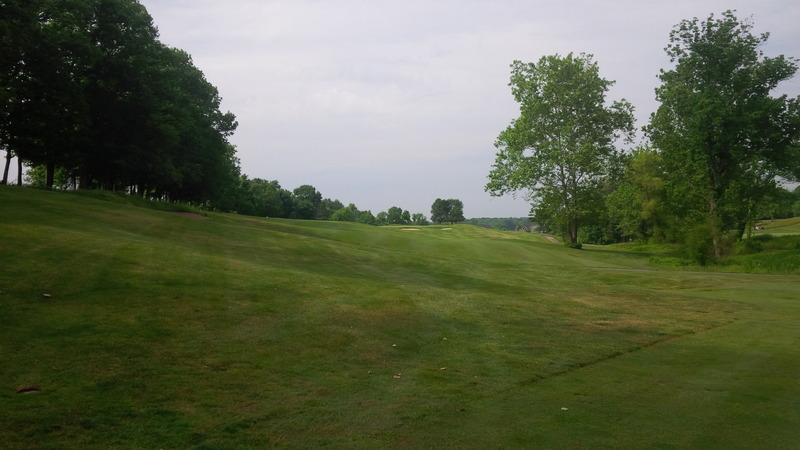 If I’m going to play golf in the greater Cincinnati area not someplace named Triple Crown C.C. or Traditions G.C., then my preference is clear: let’s play Lassing Pointe. If you have the option, I highly recommend that you do the same. 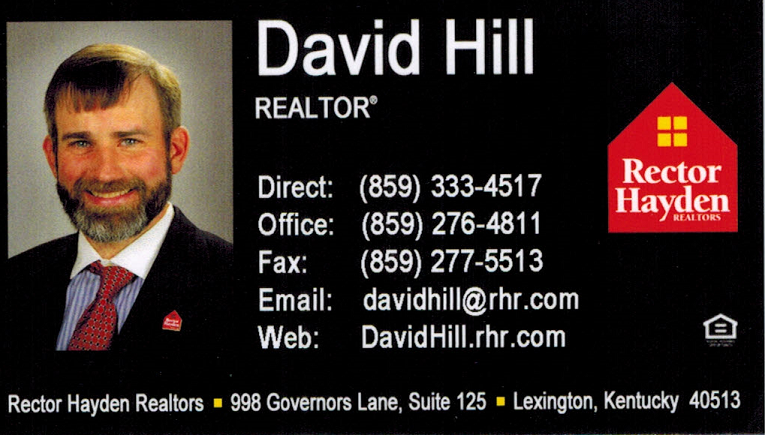 Looks like Kentucky is a state I will have to visit. Lassing Pointe sounds fun to play. Thanks for the review. 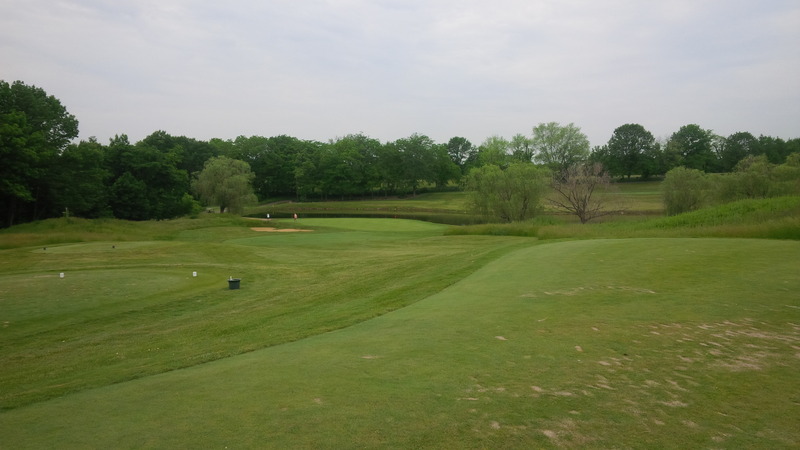 Kentucky is great for golf for a lot of reasons, not the least of which is that there are some really nice public and semi-private courses that are really inexpensive. Also, the terrain of Kentucky provides tremendous variety, as the land changes so drastically from the Appalachian Mountains in the east, across the Bluegrass Plateau and Ohio River Valley, to the flat lands of the Louisiana Purchase and Mississippi Delta in the western end of the state. You just let me know when you feel like coming south and you’ll have your own personal tour guide. And it will only cost you 3 strokes a side!